A while back for Fairy Tale Fridays, I had the opportunity to discover the author Shannon Hale and her graphic novels, Rapunzel's Revenge and Calamity Jack. This time around with a little urging from a couple different bloggers, I decided to pick up yet another modern fairy tale by Hale . . . The Goose Girl. Last month, I actually read and reviewed the original tale by The Brothers Grimm. The original was a short tale with a true fairy tale ending, a fun read with a few bits of gruesome details true to the Grimm form. Once I was convinced to read the book, I had to know how the modern version compared to the original. Hale's The Goose Girl introduces us to Ani, a sweet little thing born into royalty, but with special abilities. As her aunt shares with her at a young age, there are three different kinds of these abilities . . . (1) the gift of people-speaking . . . the gift of being able to talk and be listened to, respected, and loved; (2) the gift of animal-speaking . . . the gift of speaking to animals and understanding them; and finally (3) the gift of nature-speaking . . . the gift to hear and understand the many pieces of nature, such as trees, wind, and fire. Ani's mother possessed the first, Ani's aunt possessed the second, but the third was very rare, and often thought to be forgotten. Thanks to Ani's aunt, she too was able to learn the gift of animal-speaking, particularly with the birds and with one lone horse. As in the original, Ani was arranged to marry a prince in the country of Bayern. As she sets off on the long journey, her maid servant whom also has one of the gifts, convinces some of the guards to revolt and assumes the role of Ani, the princess. Ani is forced to survive on her and find her way back home. It is truly a long journey, so she takes the role of tending the geese to earn money to finance her way back over the mountain to her family. I loved Ani's gift, how she grew and matured throughout the story, discovered her strengths and how to use them, found true friends and supporters, and survived her horrific journey. Hale sticks to the details of the original, making me appreciate her modern version even more. And, the details that she adds makes it even magical! When I read the final page, I felt beyond satisfied. I grew to love the characters, the relationships among them, both in the good times and the bad. It was shortly after finishing the tale that I discovered that Hale actually went on to write some sequels to this book, and I am excited to read the follow-up tales, to revisit the original characters, and learn more of where their lives may lead. For more information on The Goose Girl, simply visit Hale's website! She has some great resources there, including a link to the original tale, deleted scenes from the book, and even a lost chapter. I am definitely going to be checking these out! What modern tale did you visit this week? 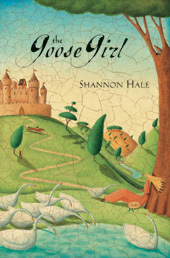 Shannon Hale is an excellent writer and I need to read more of her books-The Goose Girl included! Thanks for reminding me. I need to pick this one up sometimes. It sounds wonderful. Peaceful Reader . . . I've only read 3 of Hale's, but have loved every single one! carolsnotebook . . . It does start out a bit slow, but picks up fast! Definitely recommend it! The1stdaughter . . . You're welcome!! I hope you enjoy it as much as I did! I just need to check out the sequels now! I do like Shannon Hale a lot so I'll have to read this one! lisa :) . . . I have not read Birdwing yet, but I am definitely going to add that one to my list! Thanks for the recommendation!